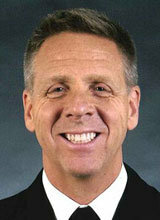 Adm. Philip Davidson nominated as U.S. Pacific Commander. April. 12, 2018 08:26. by Gi-Jae Han record@donga.com. The U.S. Department of Defense announced U.S. Fleet Forces Commander Philip Davidson as its new Pacific Commander on Tuesday (local time). The incumbent commander, Adm. Harry Harris, will be discharged next month to take up his new post as the U.S. Ambassador to Australia. Davidson, who has led the Fleet Forces Command since 2014, has served as commander of the U.S. 6th Fleet covering East Atlantic and Mediterranean and deputy commander of U.S. Naval Forces Europe and Africa and the U.S. Forces in South Korea. Davidson had attracted public attention when he was assigned to launch a separate review of an Aegis-equipped ship managed under the 7th Fleet, which was involved in two accidents with merchant vessels, killing 17 sailors at sea. Typically the U.S. Pacific Commander is assumed by the Commander of the U.S. Pacific Fleet, but former Commander Scott Swift was relieved last year due to the accidents.